Is Motorola planning another laptop dock for the next Moto X? The Motorola Atrix 4G with its lapdock accessory was the definition of ahead of its time. Mobile hardware wasn't ready to power a laptop experience and Android was nowhere near ready for the big screen. In the years since that failure in 2011, the technology has come around, as proven by the Asus Padfone as well as Windows Continuum efforts. Now, there's a chance Motorola may be making another attempt. Earlier today, proper leaks came out showing what the next Moto X and Droid devices and some eagle eyes noticed that the phones have a set of 16 gold pins along the bottom of the back side of the devices. These are very suspicious because they definitely point to some sort of dock connector coming along with the new Moto handsets. It could be something as simple as a dock charger, but 16 pins seems like a lot for something as simple as that, and pins for charging are usually found on the edge of a device, not along the back. The more interesting theory is that the pins would work by docking the phone into a tablet or laptop. Manufacturers are trying to find keep up sales by finding ways to offer new experiences that extend the use of a smartphone. LG has its new "friends" lineup of swappable accessories, so it wouldn't be terribly surprising if Lenovorola has a similar idea for the new Moto devices. Unfortunately, the announcement of the next Moto X isn't expected until late August, so we may have a while to wait before finding out. is that phone running OSX? Motorola doesn't make OS/X devices. Nobody but Apple. Besides I like Motorola phones. They are solid devices with a streamlined version of Android. I hope they do come out with another atrix like device. Especially now the they have the RAM, storage, and processors that can handle it. 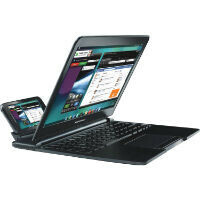 The last atrix only had a dual core 1ghz processor, with 1gb of RAM and 16gb of storage. So now if they use a Snapdragon 820 or higher, with 4gb of RAM or more, and 32-64gb of expandable storage, then it should be a great device. I wouldn't mind seeing Chrome OS and Android together on this device. No, that was Webtop. It was the required program to "marry" the Lapdock to the Atrix. Moto killed Webtop with ICS which is why it wouldn't run on the Atrix HD. I doubt it is a dock port. It may be a 10 minute charging port. We do not need more docks when we can wirelessly cast to any screen already since kit kat. The problem with casting the screen is that it doesnt change the UI to accommodate the increase in screen size. The padfone infinity I had worked well to switch from phone to tablet bit unfortunately it did not go laptop mode like the first padfone did and that was largely what was needed. This would be great now and I hope they release this converter so everything can run off the phone. The connector gets rid of the pairing problems seen in the lines of the pixel c and makes it possible to alter ui. I just hope they make phones of different sizes for this. Don't want it only working with a phablet or something. Same here. But more than that button, the bezel. I thought g4 was bad, now I think that was somewhat better than this. It's obviously a speaker grille not a connector of any kind. Anyone can see that. The reason people are thinking connector is that if it were a speaker grille, the holes would be black not gold. If you look at the difference between pic 1 (the Moto X) and pic 2 (the Droid) you'll see one has gold holes, the other has black. And the hole pattern is also different between the two. I am seriously looking for "moto x force 2"
Sorry guys, but Motorola wasn't the first with a slave terminal. The Celio Redfly was out long before the Lapdock for WinMo and BlackBerry OS 4.5. Technically, the first companion was the ill-fated Palm Foleo in 2007 but that was never actually released.